Question: Paris will soon host next round of talks of the Foreign Ministers of the Republics of Azerbaijan and Armenia, under the OSCE Minsk Group co-chairs on the resolution of the Armenian-Azerbaijani conflict over Nagorno-Karabakh. Taking into the consideration, the results of the talks that were held in Moscow, what do you expect from the forthcoming Paris meeting? Answer: I think there appeared to be a good opportunity, for us to feel the points of contacts, in more difficult topics of the resolution process. In that context, the meeting that was held in Moscow was very useful. There is a good-old saying The Devil is in Details' and when you go into the details, you find too many problems. I am not going to be too much optimistic, but at the same time, I want to estimate the situation materially. There are new elements, which can be applied, new ideas, which were offered by the co-chairs, and in this context there appeared to be a new area to work over these ideas. Question: Why haven't these points of contacts' existed to date? Answer: Search for opportunities is an agonizing underway. It is necessary to find a fragile balance to bring the positions closer. It is a difficult and painstaking process to unify the existing polar and opposite viewpoints, considering how sensitive the Nagorno-Karabakh problem is, both for us and Armenia. Of course, in that context, our key task is to try to bring the positions closer. Still, it is difficult to state whether it will occur, and I am even not going to, since I can't look ahead that far. However, we have such an intention as well. Everything is so delicate that I would not say whether there will be a breakthrough. My principle position is that if there is a will to resolve the issue, it is necessary to go till the end. Question: Armenia stated its agreement with basic principles' of the peaceable resolution of the Nagorno-Karabakh conflict, proposed by the co-chairs. 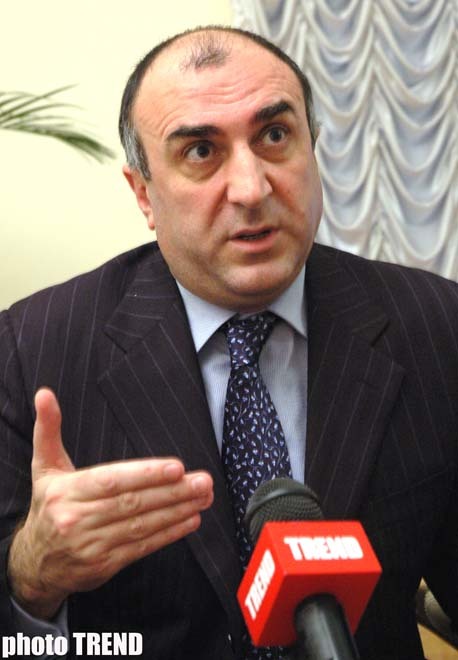 Do these principles meet Azerbaijan's national interests? Answer: By the highest standards, for the time being, it is difficult to state whether, who agreed upon what, in the basic principles' that the co-chairs currently offer. There is a rule, that until the whole document is coordinated, it is regarded as uncoordinated. In this respect, I do not accept such PR-moves. It's astonishing to demonstrate the constructivism to the domestic public. In that case we come out from the so-called Prague process', and the major elements of the conflict resolution, which were taken for the bases of further actions. We understand that it is the very base, through which we are ready to continue working. It would be more ideal if it yielded a successful achievement. For the sake of objectivity, I could state that many elements, not even in details, have been coordinated as principles. There are several clauses from the opposite side, which should be solved, in order to move the process ahead. Question: How do you view the results on Lachin and Kalbajar talk? Answer: It is viewed as one of the problems. I hope we will be able to find ways for resolving it. Question: At what stage is the issue on armed conflicts in the territory of the Organization for Democracy and Economic Development - GUAM, submitted for the UN General Assembly session? Answer: It's on the agenda, confirmed by the General Assembly. By the end of October, Tbilisi will host a meeting of representatives for the GUAM member-countries. The agenda will include discussions over further activities under UN. The priority of the discussions is that they are not held at the Committees of the General Assembly, but directly at the plenary meeting. The issue will be permanently in the agenda till September 2007. Question: President of the Republic of Azerbaijan, Ilham Aliyev is expected to pay an official visit to the Republic of Belarus. How do you estimate the current cooperation between the two respected countries? Question: Several agreements are under discussions in connection with the visit. Almost 15 years ago Azerbaijan and Belarus were part of a unified country. Respectively, the economic relationships were left behind since that period. The Azerbaijani Prime Minister has recently visited this country. The economic relationships that existed during the Soviet Union are interesting enough to progress in the current stage and to give a new impetus to the bilateral relations. Secondly, there is also a humanitarian cooperation. A large Azerbaijani community resides in the Republic of Belarus. Luckily, we have never heard of any problems regarding Azerbaijanis in the country. Question: The deterioration of the relationships between Georgia and Russia is in focus of the world community, presently. Has Baku received any official appeals that would invite to mediation in the settlement of the relationships between these two neighboring and friendly to Azerbaijan countries? Answer: Last week I met with the Russian Foreign Minister, Sergey Lavrov, in Moscow to discuss this issue, and had a broad exchange of views. Our position on the issue is well-known. I stated it both in Moscow and Baku. We consider that the spirit of good neighborhood should always exist, while critical issues should be resolved exclusively through the diplomatic channels. It is also important in the regional context, and as I felt during the talks with Lavrov, Russian Federation understands it too. Question: What are your views on the perspectives of the development of the GUAM [a regional organization among Georgia, Ukraine, Azerbaijan, and Moldova]? What initiatives and projects can be proposed in this organization in the nearest future? GUAM is and interesting and vital organization. Speakers of the GUAM member-countries are planning to meet shortly, whilst the national coordinators are meeting in late October. We expect the newly elected Secretary General to take his office term on February 1, 2007. We have coordinated many issues and I believe in its future. Question: Several days ago Prophet Muhammad was insulted in Denmark again. What is the OIC's reply in this respect? Answer: The Baku Declaration of the Foreign Ministers of the Organization of the Islamic Countries (OIC) anticipates conducting forum on Mass Media and Tolerance. It will be held within the framework of the OIC. The conference is of great interest of big international organizations such as the European Union and OSCE. Therefore, we are working over the format of the conference in order to organize the dialogue. At least, it is necessary to learn and to listen to each other. An ability to listen is a great skill. It is better to listen to each other, and we are working in this direction. It is one of the serious challenges exiting worldwide. Question: Georgia has set up an intensive dialogue with NATO. Does Azerbaijan have similar intentions? 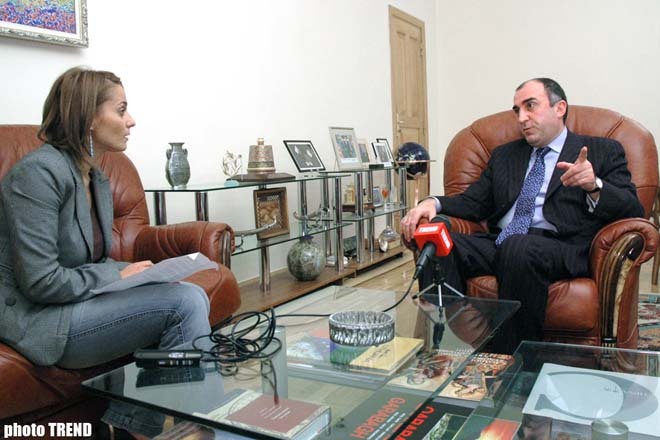 Is the issue expected to be discussed during President Aliyev's visit to the Brussels? Answer: During the recent visit of the NATO Special Representative to Azerbaijan for South Caucasus and Central Asia, I understood that the interaction that exists between Azerbaijan and NATO is on high level. The Individual Partnership Action Plan (IPAP) of the Republic of Azerbaijan with NATO is considered for 10 years, and we implement it successfully. The plan is large, and it contains many items concerning not only the Defense Ministry, but also other force bodies, as well as the Foreign Ministry, Customs, Frontier Service and other administrative bodies. We are doing a lot of work in that direction. Basically, the work continues in progress. However, taking into consideration the sensitivity of this milestone, we should not anticipate the developments.